Few things in life can be more devastating than being told that you have cancer. As the only plastic surgeon in this immediate area, Dr. Fulks has been the central reconstructive surgeon for many General Surgeon/Breast Surgeons. This has afforded him the opportunity to care for many women going through this most difficult time. It also has allowed him to utilize multiple different reconstructive options for patients. these pictures have been selected to demonstrate multiple different surgical options for patients. Although most cases today are performed at the same time as the mastectomy, many of these cases are delayed cases. 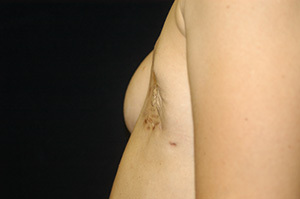 These pictures may be more dramatic because the mastectomy deformity is seen compared to the pre-operative appearance. The word "delayed" is used to describe this procedure as opposed to a "immediate" reconstruction. The multiple options are beyond our purpose for this website.